My definition of a smartwatch is a device you wear on your wrist, that interacts with your smartphone, and displays at least the time. 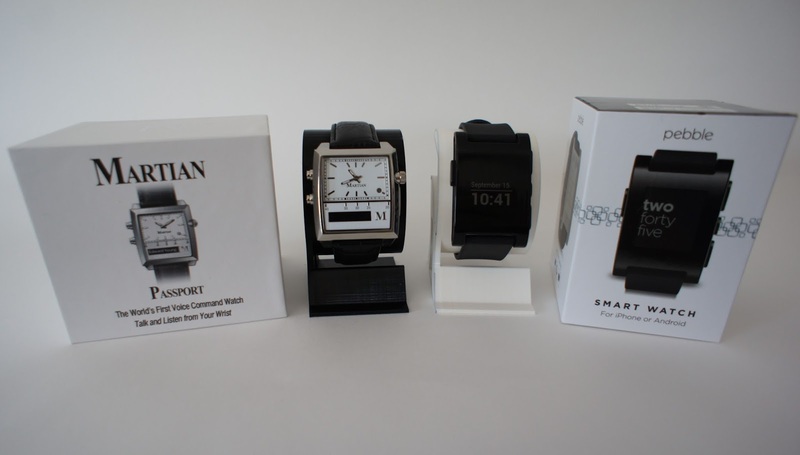 Regardless of the definition, smartwatches are all the rage. Everyone from Apple to Samsung to Google to Sony to Nissan either has announced one or is rumored to be working on one. Despite all the hype, there are not many you can actually use today. The $150.00 Pebble is available (I bought my at Best Buy). 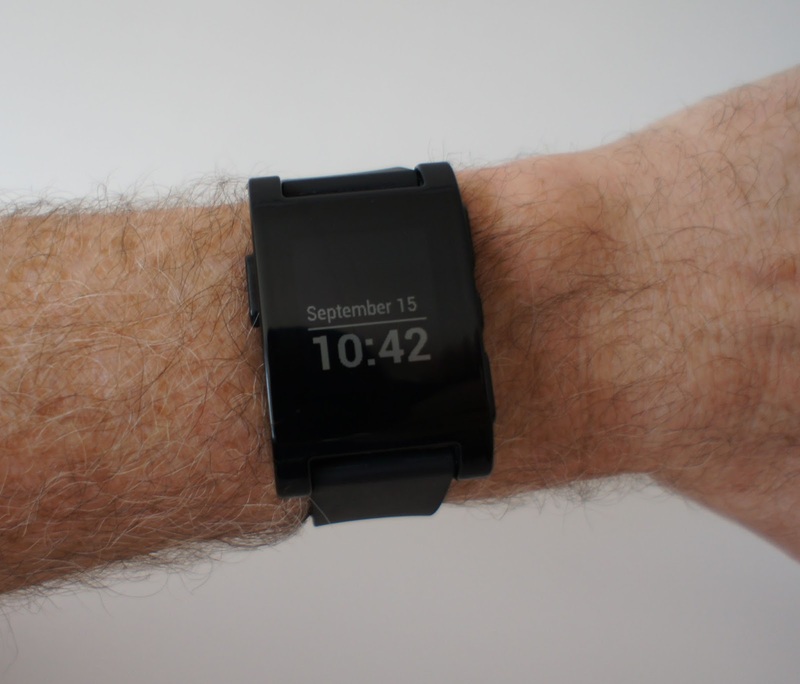 Though I have lots of complaints about the Pebble, I plan to keep on wearing it. I think it is worth considering if you like the latest gadgets. I tested the Pebble with an iPhone for a couple months, similarly to how I previously looked at the Martian smartwatch. 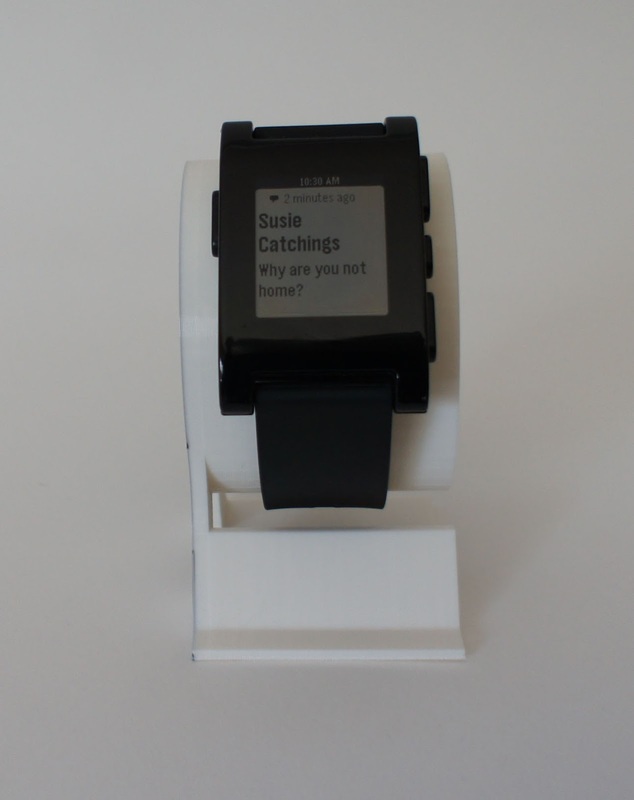 The Pebble communicates with your smartphone using Bluetooth and was easy to set up. 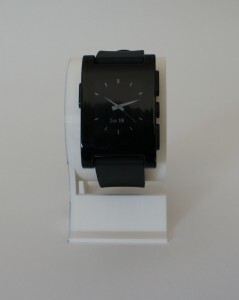 The Pebble looks very nice and I’ve gotten multiple compliments on it. It looks like a somewhat bulky watch that normally just displays the time on your wrist with its LCD screen. You can choose among multiple built-in watch faces by pushing the top or bottom buttons on the right side of the phone. Pushing the button on the left or shaking your wrist turns on the backlight for a few seconds so you can better read the watch in the dark. The Pebble vibrates when you have a text, an incoming call, or one of the other notifications it supports like email, appointments, or reminders. For me, the vibration on my wrist is a great feature since I often don’t notice the vibration of my iPhone where I normally wear it on my hip . 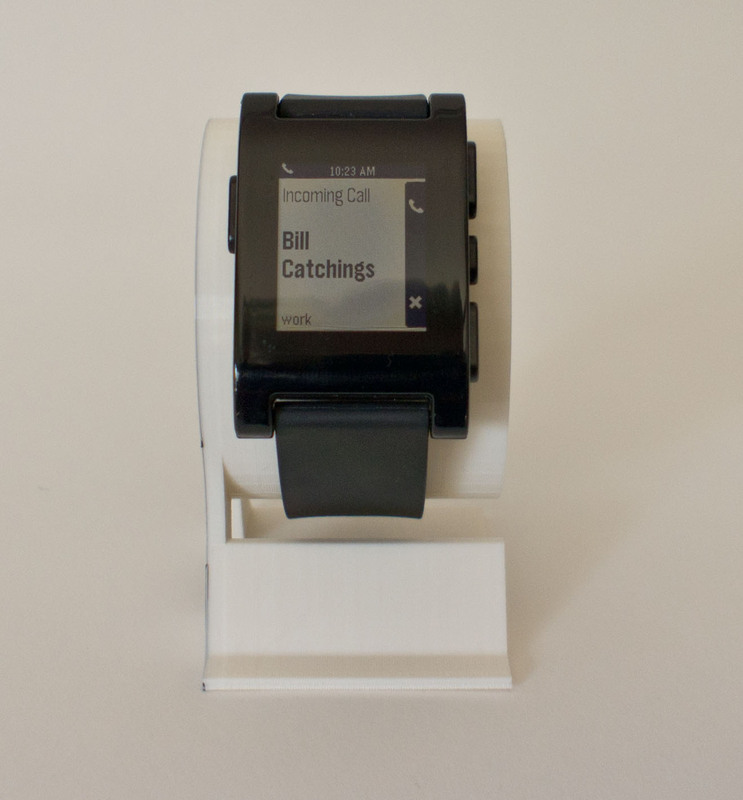 The Pebble also displays the text, the identity of the incoming caller, or some info about the notification. You can scroll through multiple texts or ignore an incoming call using the buttons on the right. I find this feature very useful as it allows me to quickly glance at my wrist and decide whether or not to interrupt things for an incoming text or call. There is a built-in music app that allows you to pause and resume the music on your smartphone, but I could not think of why I’d want to do so. As with the Martian watch, I did not bother to enable email notifications as I get too many. My trip to Hawaii offered some good real world tests of the Pebble. It had no problems when I wore it under the water while playing pool volleyball and in the ocean. The watch successfully changed time zones after my flights when the iPhone did. The iPhone app, however, did crash one time when the time zone changed. There is an app on the iPhone (or Android phone) that you have to run to make this all work. The iPhone app is clean and not confusing. 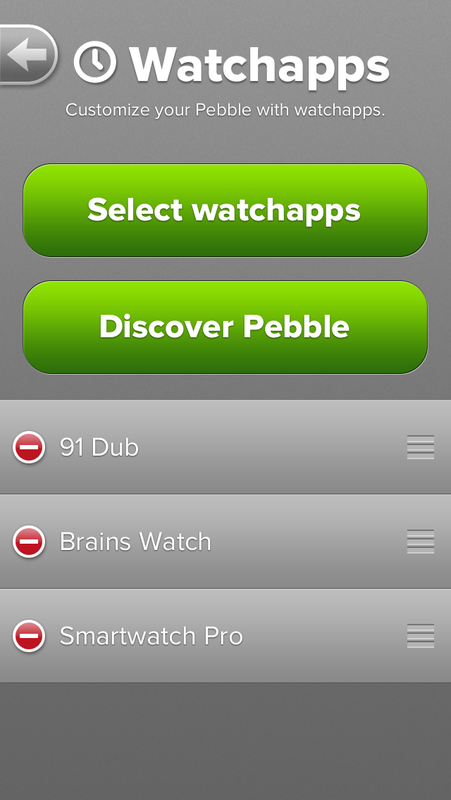 There is not a lot it allows you to do, just configure things and select new watch apps. Appointments, however, have the IOS problem where every time the phone and watch lose connection (such as by going out of range when you charge your phone at night), you have to re-enable the notifications. Email notifications (anything other than calls and texts) have the same issue. The Martian watch had similar problems. It is supposed to be fixed in IOS7, so I should know soon. 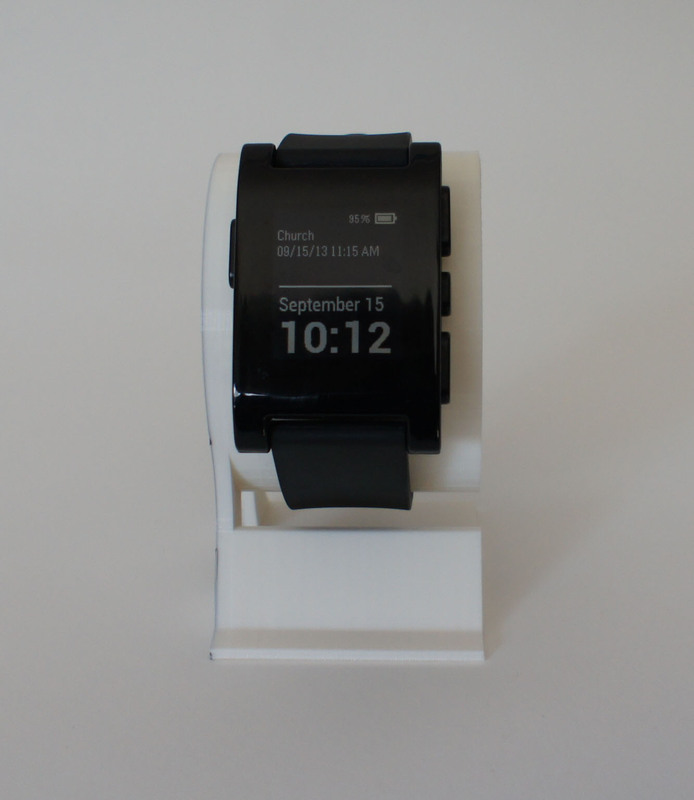 The Pebble’s battery lasts about a week, which is good. However, there is no battery indicator unless the battery is running low. Even then, it is only visible by navigating to a settings screen. The watch needs a constant battery indicator, as I kept being surprised that the battery had run out. There are plenty of other annoyances. For one, the recharger is an odd connector (possibly to help make it waterproof) that means one more cable in my briefcase when I travel. 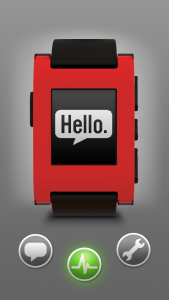 The Pebble doesn’t always seem to have the same info as the iPhone. For example, it often gets the phone number, but not the info on who it is (which is correctly displayed on my iPhone). This may well be another aspect of the IOS issues with notifications. There were other glitches I ran into. 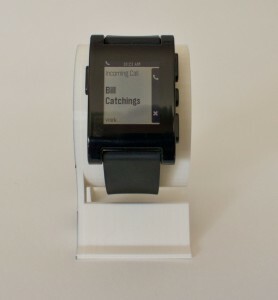 A few times the Pebble kept vibrating on my wrist after I answer the call, and one time, even after I finished the call. 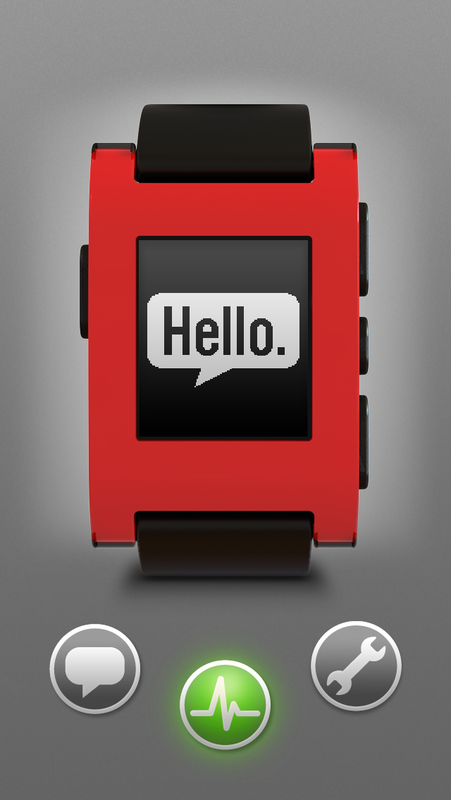 There are apps for the Pebble, but few are from Pebble and the rest are not well curated. Like most folks, I don’t want to have to explore one more platform for the right apps. Some apps claim (like SmartWatch+) to fix the IOS related issues, but require jailbreaking your iPhone. A simpler app that I downloaded and installed was SmartWatch Pro. It is a promising, though flawed, app. If nothing else, it gives an idea what the Pebble could be. It displays a battery indicator in the upper right (for your phone rather than the watch, annoyingly) and your next appointment above the usual date and time. It also offers some other interesting features. However, it drained my phone battery fairly quickly and seemed to cause some problems with dropping the Bluetooth connection between the devices. Trying to compare the Pebble to Martian is not easy as they take very different approaches. The Martian is both more traditional as it has an analog watch, but more feature rich because of its microphone/speaker and other features. On balance, I like the Pebble better. It manages to pick the most critical set of features and implement them fairly well. I’m looking forward to Kreyos Meteor as it claims it will have the features of both the Pebble and Martian watches. I’m also hoping they can meet their November shipping date. 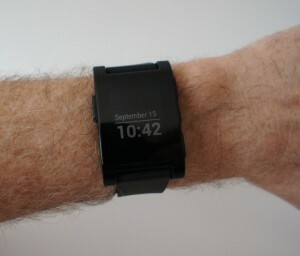 Until the Kreyos Meteor arrives or someone else ships a watch worth looking at, I’ll continue to wear the Pebble. 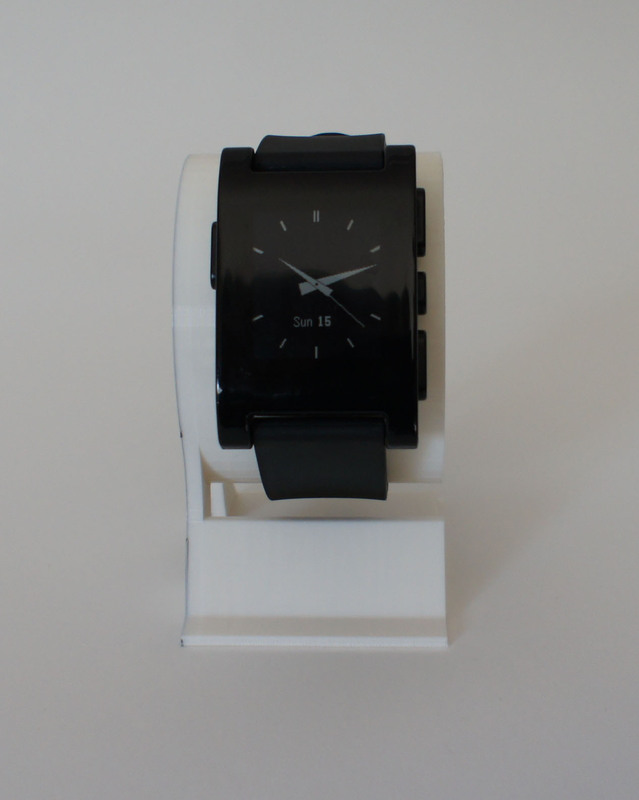 As an unrelated aside, I’m pretty happy with the watch stands I printed out with my Makerbot Replicator 2 3D printer!